A fortress near the Jordan, north of the river Jabbok and 21 miles south of Pella. At the beginning of the first century B.C., Amathus was an important fortress held by the despot Theodorus. About the year 98, Alexander Jannæus captured but could not retain it, and therefore, a few years later, razed it. Amathus became the capital of one of the five districts into which the proconsul Gabinius divided Palestine in the year 57 B.C. According to the Talmud (Yer. Sheb. ix. 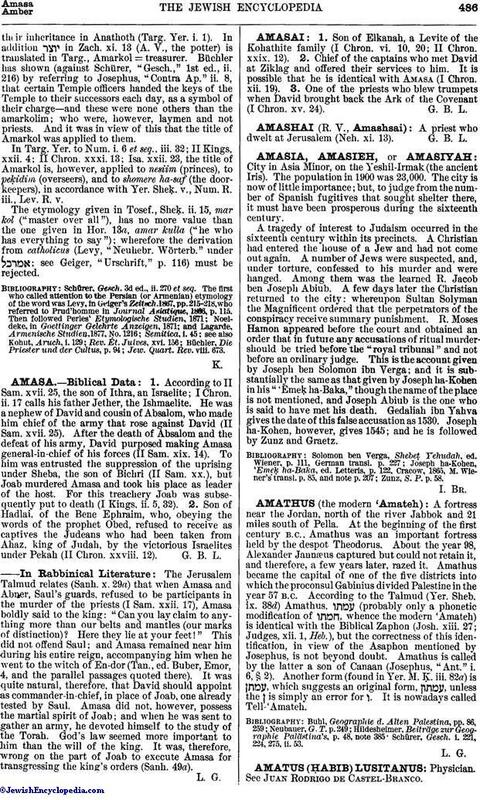 38d) Amathus, (probably only a phonetic modification of , whence the modern 'Amateh) is identical with the Biblical Zaphon (Josh. xiii. 27; Judges, xii. 1, Heb. ), but the correctness of this identification, in view of the Asaphon mentioned by Josephus, is not beyond doubt. Amathus is called by the latter a son of Canaan (Josephus, "Ant." i. 6, § 2). Another form (found in Yer. M. Ḳ. iii. 82a) is , which suggests an original form, , unless the ן is simply an error for ו. It is nowadays called Tell-'Amateh. Schürer, Gesch. i. 221, 224, 275, ii. 53.